To save yourself some time, add your favorite widgets to the Home screen of your phone. Is there actually a difference between apps and widgets? The short answer, yes. In a nutshell, apps are programs you have to open by touching an icon. Widgets are programs that are always active on your Home screen. Some of the most common widgets used are weather updates, event calendars, and Google Search. 1 From the Home screen, touch and hold an empty area. 3 Select the desired widget. 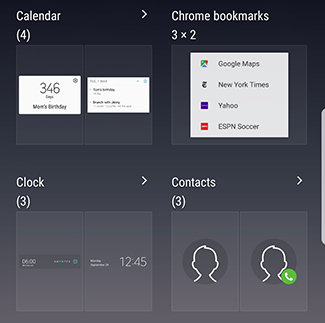 Some widgets are organized by category. Touch a category to access the widgets included. 4 Touch and drag the widget to the desired location and then release. If there is not enough space for the widget on the current Home screen, the widget will be placed on a new Home screen. 5 If the widget is resizable, you will see a frame around the widget. To adjust the size of the widget, touch and drag the edges of the frame. 6 To exit edit mode, touch anywhere outside the widget. 7 To move the widget, touch and hold the widget , and then drag it to a new location. 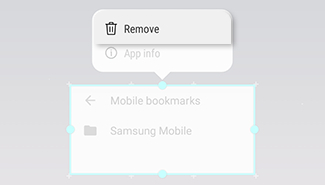 1 Touch and hold the widget you want to remove. Galaxy Note8: How do I set up and use Game Launcher on my Samsung Galaxy Note8 (SM-N950W)? Galaxy Note8: How do I use device maintenance on my Samsung Galaxy Note8 (SM-N950W)?